Can PhotoPlus 5 beat Photoshop at its own game? Can this low-cost alternative really take on Photoshop Elements? Photoshop has become a by-word for image editing. Pictures aren't enhanced, they're "Photoshopped". But Photoshop CS is an extremely expensive program, especially for amateurs, while the cheaper, more amateur-orientated Photoshop Elements and Photoshop Touch lack many of its high-end features. Does this leave a gap for a high-powered, low-cost image editor such as Serif PhotoPlus X5? It really is like a kind of cut-price Photoshop. The application's interface, which has been subtly updated in this latest version, has a vertical tools panel down the left-hand side whose contents will look pretty familiar to anyone who's used Photoshop. And on the right side of the screen is a series of stacked palettes offering Adjustments, Layers, Channels, Macros (Serif's alternative to Photoshop's Actions), History and more. Actually, Photoshop has moved on. This is what it used to look like, and in many respects Serif PhotoPlus X5 looks more like Photoshop Elements now. It does offer features that Elements doesn't, such as Channel adjustments, Curves and more advanced black and white conversion tools. But a fly-out 'How To' panel on the left shows that Serif is also targeting novice and intermediate users, which is Photoshop Elements territory. This market is also targeted by fellow Photoshop rival software, Corel PaintShop Pro x4, so Serif isn't without competition. This main rivalry with Photoshop Elements is emphasised by Serif PhotoPlus X5's new Organiser application. It fills exactly the same role as the Elements Organizer, bringing together all your photos into a centralised catalogue, where you can apply tags to photos, create smart albums based on specific search criteria, locate your photos on a map and even stack related photos so that they don't become separated. 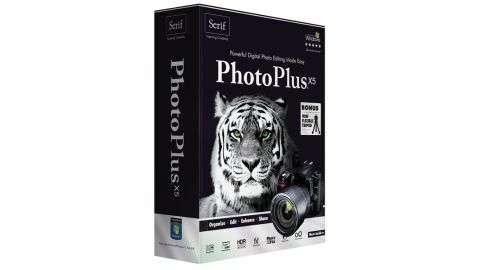 You can open photos in Serif PhotoPlus X5 direct from the Organiser, and open the Organiser to find photos from within PhotoPlus X5. When you save a new version of a picture it appears in the same folder as the original in the Organiser, although it doesn't offer to stack the new version with the existing picture (Elements does, which is very useful). There's a rather dated look about the PhotoPlus Organiser compared to the Elements Organizer, and a few rough edges too. It's less sophisticated - there's no equivalent to Elements 10's visual search tools, or its in-built quick image fixes - although you can open pictures in Serif's PhotoFix window. More on this shortly. You do get a set of photo projects, worth £19.99, courtesy of Serif's CraftArtist scrapbooking product, and you can also upload your photos to Facebook or Flickr. The new Organiser application is the big news in Serif PhotoPlus X5, but there have been other enhancements, too. You can now apply vibrancy as well as saturation adjustments - vibrancy targets weaker colours for enhancement and avoids over-saturating skin tones. A new Clarity filter applies a localised contrast effect that makes outlines stand out more clearly and gives photos more punch. The Brightness and Contrast adjustment has been improved, as has the Adjustment panel, and there are some new blend modes to create different effects when combining image layers.